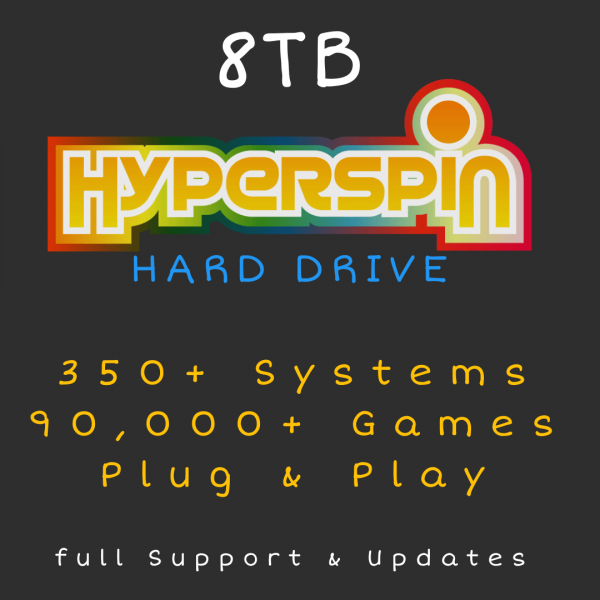 Hyperspin offers the best arcade frontend & we have pre-configured it for you with all media, emulators & roms so thats its ready to plug & play! Latest Emulators Configured for optimial performance. We provide you with simple Setup Instructions which are Included on the Drive, this takes no longer than 10-15 minutes. We also offer FREE Remote Support to help you get up and running. Some sellers make you pay to update your hyperspin drive, we give you lifetime access to drive updates available via our secure private servers. We offer free support, most issues are caused by the configuration of your PC and not the actual drive and we can solve these quickly for you! Failed Hard drive? no problem you can re-sync your hyperspin drive from our servers or re-send me your drive & I will re-clone it for you. Q: Where do you post to and what is the turn around time? We ship worldwide and offer next day delivery for UK mainland, 2-3 days for highlands, 3-5 days for europe & 5-7 days elsewhere. Q: What controllers is this compatible with? This is configured to work with Xbox 360 controllers (Wired or Wireless), However other controllers can be configured. Q: What type of hard drive is this provided on? We can also supply this on an Internal Drive upon request. Q: What hardware specification do you recommend? The better the spec the better the gameplay, something like a dual core PC could play the older systems, however the newer systems need a little more power. If we build a system we usually build an i5 with 4GB+ Ram with a 2GB 750Ti or 4GB 1050Ti Graphics card running Windows 10.